Like many others that are in to woodworking, I have always looked upon sharpening as a necessary but evil chore.Drag out the stones. Drag out the water or oil.Search around for the damn jig to hold the chisel at the proper angle.Stroke, stroke, stroke. Now spend time on the honing. And sometimes, even when you thought you had done the best you could do, the thing still is not as sharp as you would like it to be. Cue the Tormek.I looked for a long time at many sharpening machines and systems. I also spent time reading reviews on the various systems and methods out there. I love delta tools, and was about ready to get one of their sharpening centers when I suddenly went into overdrive about Tormek. So I said "what the hell" and bought what was being offered as a Cabinetmakers Package deal. I will never regret the decision. All I have told my woodworking friends is that if you do not own a Tormek, then you are using dull tools!! Period. This baby can put an edge on a chisel that is truly scary. I have never been able to obtain such an edge and a polish by hand. Now I am confident that there are those of you out there who can and do obtain comparable results by hand, but for me, I'll leave it in the hands of the expert, which in this case is the machine. But a few more jigs...hell...buy them all over time. don't feed the dog for a few weeks, or go to cloth diapers for the kid...just save a few bucks and get to sharpening. I have already saved money by sharpening my own planer and joiner knives several times, and you know how expensive those knives can be, and how active woodworking can eat 'em up.Now these babies are kept sharp and ready. And lathe tools? My God...it's like a whole new world. I feel like I was using a screwdriver to turn with before I got this tool. It puts such an edge on your lathe turning tools that it is even more of a pleasure to turn, and, naturally, requires less effort. I am nothing but satisfied with the tool. Pricey, yes. But you are paying for precision, accuracy, repeatability, and results. Just do it. There is no doubt that this machine produces the sharpest edges I've ever had on my tools. I got real sick of sharpening the "old" way with bench stones, oil, honing guide, etc... It seems like I spent a lot of time getting things set up and then was only marginally satisfied with the results. The Tormek system is easy to set up, the Angle Master is very ingenious, and the results are perfectly repeatable and extremely quick. I can sharpen a set of seven chisels in the amount of time I used to spend on just one. I use mine for plane irons, chisels, planer and jointer blades, and knives. I don't use it for turning or carving tools so I can't comment on its value in those areas. - Uses the same stone for grinding and polishing. Sounds too good to be true, but it works. - The array of jigs available make it possible to sharpen just about anything imaginable. Rather than having a simple tool rest that sharpens everything ok but not great, they've designed a whole system that makes it possible to put a keen edge on every tool you own. - Water cooled, low RPM. Doesn't create sparks or destroy the temper of the tool. Other water cooled sharpeners are available but not nearly as capable as this one. - Rock solid construction. Admittedly, this thing isn't very complex but the machine itself and all the jigs are top-notch. - Outer end of stone is flat so you can lap the back of your chisels and plane irons. - Makes my kitchen knives unbelievably sharp. Never knew what I was missing before (I like to cook). - You really can't get by without the stone grader. Don't know why they don't include it in the base package. Make sure you get one. - Jigs are expensive. When you get some of these jigs you'll be amazed that they charge so much for it. And unless you don't plan on sharpening anything more than chisels and plane irons, you'll need more jigs. The flip side is that you need only buy the jigs you want. - Some of the advertised uses seem silly to me. I can hone the edge of a hand scraper with a bench stone in about half the time that it would take to set up the Tormek. And who really needs a razor sharp edge on their axe? Overall, I'm extremely glad I got the Tormek. I don't like spending time sharpening my tools-I like to spend time using them. The Tormek allows me to get the onerous task of maintenance over and done with so I can move on. I make my living with tools, ten years as a contractor and the last twenty as a blacksmith. Even though I buy top of the line tools, seldom does a tool surpass my expectations. The Tormek grinder is a notable exception. I bit the bullet and bought the complete setup with all the jigs. I started by grinding about 20 wood chisels that were in various states of dullness, including some with deep nicks. Without exception, I was literally able to shave the hair off my arm with every single chisel after sharpening them on this grinder. I also sharpened some scissors and on my first attempt, was able to cut a piece of cloth as narrow as a single thread wide. A hand plane was able to cut a shaving thin enough to see through. Tormek includes a jig that makes setting the exact blade angle a simple matter and proper angle/blade geomeetry is the key to a good edge. Though the tools are sharp when you finish grinding, the leather honing wheel puts the finishing touch on a razor edge and cutting a thin curl across the end grain of a piece of wood is a simple matter. The instructions are clear and the machine well engineered. While a bit pricey for just home use, even hobby woodworkers would benefit from this investment. The tool is not difficult to use and I had my wife sharpen a couple chisels. There was no difference in the quality of the edges from those I did. I performed before and after tests with a chisel that appeared sharp. Initially it would cut a reasonably even curl going with the grain of the wood. After sharpening on the Tormek, it would cut the same, or even better, curl going across the grain and through a knot. The jigs are versatile enough to allow for sharpening a wide range of tools. The edges I obtained were, in nearly all cases, better than the factory edges on a new tool. I highly recommend this grinder, especially to anyone who regularly uses, planes, chisels, gouges, and woodturning tools. It is a heavy duty machine that will do all the manufacturer claimes, and more! You will wonder how you ever lived without it. Let me say that the Tormek system is a big bullet to bite. Seems like a lot of money spent just to sharpen things. When you get into using the sharpening system, you soon realize, that the time spent on sharpening is cut in less than half. Additionally the keen edge, (almost scary) that it puts on your tools, saves you a lot of time, and enables you to produce fine work. Instead of spending a half an hour sharpening for each 20 minutes I spend on the lathe, I spend less than half of that. And the time that I spend is more pleasurable than the stroke, stroke, stroke, with a stone and oil. The main draw of this complete kit, is that it saves you a lot of money over the individual items. The Tormek system, hands down, has been touted as the best across the board, in all of the woodworking reviews. The tool stays cool, the edge is brought to a polished finish, and it is easy to use. With the accessory kit, you can even sharpen your neighbors kitchen knives. In addition to just about every other sharp edge you have in the house. The accessories are quality made, and should last a lifetime. A bit pricey yes, but once you go for it, you know your set for any kind of sharpening you may need. My only gripe about the system, is that you have to regrade the stone for each tool. I have been trying to think of a better way. The only solution I can come up with, is to have twin stones, side by side. Dress them both with the diamond truing bit, to get two even-same size surfaces. Then grade one of them to 220 grit, and the other one to 1000 grit. Then when you mount a chisel, for example, you would rough it out with the 220, and immediately go over to the 1000 to finish it off. Why is this important? Because you can not remove a tool from a holder, and reinstall it exactly the way it was. You may think, well I will get it close, and if you are willing to do the finer grade on just the tip, that will work. But when you go to resharpen, you have to remove more material to redress the whole surface, in order to get the full face. Capeche? So we are back to having to redress the wheel for each sharpening. At the demonstration from the Tormek factory rep, he regraded on every tool, and spent some time leaning on the grading stone, to get it totally to the other grade. So do we see a Tormek II in the future? I think they do not want to introduce a second stone, since that is the single most expensive part of the kit, which is expensive to start with. On small tools you could regrade half the stone, and get the same effect. Thought you would find that interesting. The accessory kit is a nice package. I know restaurants, and barber shops etc, have an ongoing need for sharpening services. This setup makes it worthwhile to have an onboard inhouse service. This system is truely the best auxillary power tool I have ever owned. It has literly made my blades, chisels, gouges and scrapers razor sharp and absolutely consistent. Hand sharpening is for the birds or masochists. Now I can touch up a dull gouge in less han a minute and have a perfectly contoured, razor sharp tool and get right back to work. Although it's great for chisels the Tormek system really shines for Lathe tools and planer/jointer blades. Best investment I ever made. As an amateur woodworker, chef, and handyman around the house, the value I place on sharp tools can not be understated. That being said, there are few comprehensive options out there for sharpening all of your tools with one system. 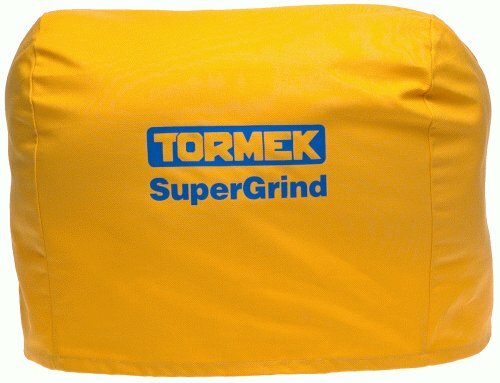 The Tormek SuperGrind is the solution. After unpacking the system, I proceded to sharpen all of my kitchen knives to a razor's edge, with ease. Previously I had to bring all of my knives to the sharpening center and pay $ dollars for the service. Those days are gone! I can now sharpen my wive's turning tools, my chisels and plane irons, even my jointer blades with one easy to use system. It makes experts out of novices, I can't praise this system enough. Buy the Tormek, expensive but worth it. My tool sharpening career began 20 years ago when I bought a few Norton oilstones. Never could master them so I upgraded to Japaneese waterstones with fair results, but a messy chore I detested. Bought Diamond stones to flatten the backs, a lapping stone with dust, and next a bench grinder. I could sharpen a blade already ground to the correct angle but forget about re-edging an angle on the grinder, blue edges every time! Bought different wheels for the grinder, same results. Next went to the Makita flat circular grinding wheel but the wheel was so soft, hard to keep it flat. Next read about a jig for the grinder and another new softer stone that would not burn edges as well as an angle devise to hold the blades at correct angles on the handstones. Bought a few new handstones, synthetic, ant tried all of these with fair results. Over the past 20 yeats I figure I must have about $1000 invested in all of this equipment (let me know if you want to buy it) and I still detested the sharpening thing. Could do plane blades and chisels so-so. I heard about the Tormek system and read the amazon reviews (which sold me)and decided to give it a try. I bought mine through Sharp Tools USA, a business that only sells this system. I splurged and got the deluxe package since buying the individual jigs I needed would have cost the same and I would be missing some jigs. Everything they say is true. 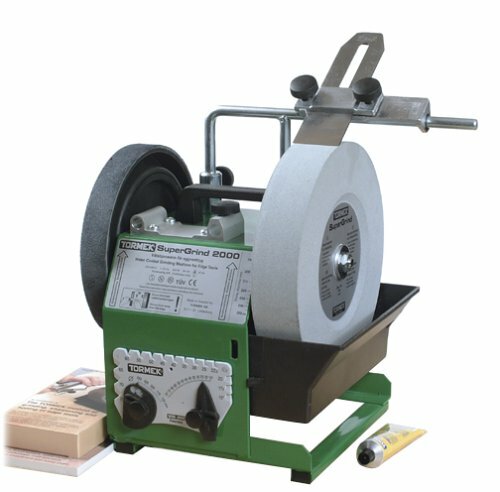 [anyone] can become a professional sharpener. I beg friends to bring their tools and knives and scissors to me. Instead of detesting the job, I now love sharpening. The only bad thing about the system is that a few scratches on the bevel remain that I guess you could lap out on the leather wheel, but these do not make a difference to me. All of my blades are now razor sharp, and in fact I don't have any hair left on my left arm from test shaving after each sharpening. This is the most expensive attachment you can buy for the Tormek system. It is also the most incredible. Before using it, I imagined the problem is not having enough surface area to hold a long planer blade, so it would have to be done in multiple stages, and that would result in less than a level blade. WRONG! This thing will make your blade perfectly level and sharp no matter how long it is. It does so even if it is not a straight edge to start with. The back edge of your blade rests on a ridge in the clamp, thereby keeping an even distance from the wheel. It is a large two part jig that slides along a set base that is fixed and not free floating. The clamp that holds your blade rides along a keyed channel. No room for an error there. How it works: First you true up your stone with the diamond truing tool. That creates a perfectly straight and level surface along the entire surface of the stone. The base, has mounting bars that replaces your existing ones, and is attached to the wide base platform. The bars have threads on them and each has a numbered adjusting disc. You use the adjustable numbered discs to get the entire jig, with your blade attached to it, level with the stone. Then you take the tilt adjusting knob, located on the back, and set the depth of how much metal you want to take off of your blade. It is easy to determine that by simply looking at the edge of the jig and viewing the gap setting. Then when you sharpen the blade, it keeps taking off material until it meets with the perfectly flat base plate. Then your entire blade is perfectly flat, at a perfectly even depth, and ultimately sharp. Since the jig is a little over 12" wide, a planer with a 12" blade will be done in a single mounting. If you have a 24 inch blade it will work perfectly with that size as well. You just reinsert it into the clamp mating the back of the blade snug up to the stopping ridge which maintains the same depth setting. Don't change your settings when you move the blade to the other half of your blade, and it will keep sharpening until it gets down to the same plane you set as the rest of your blade. Perfectly flat, smooth, and just as important exactly the same depth all along the entire surface. So your setting is referenced off of the back of the blade, rather than the leading edge. That makes a perfect depth on the finished edge. If you want to know how exacting this jig is, when you go from one blade on your planer to the next, you will need to tweak the angle adjustments to meet up perfectly with the blade. Since a simple stone grading-surfacing, will result in a slightly smaller diameter on your stone, it shows up in your settings on the stone. Now we are talking hundreds of an inch difference. This thing is so exact that I take it down to completely flat against the jig then I tweak the depth knob just a hair after stone grading to 1000 grit, so that I take off only a hair more with the finer grit setting. One other thing worth mentioning is that I used to spend hours going through multi grades of sandpaper to get a beautiful finish on my wood. When you create razor sharpness, on your planer blades, you will get a surface so smooth, and perfect, that you will not need to do all of that sanding. The wood almost looks glossy. It is a good idea to go over it lightly with 220 grit to increase the adhesion qualities of the finish. I quickly learned that any time spent sharpening blades is quickly saved in not having to over sand it. Your projects come out perfectly sculpted to size without showing the over sanding problems of valleys and dimpled edges. I must admit it took me an hour the first time to learn how to remove the blades from my jointer and reinstall them with the depth gauge and get final settings that are perfect. Next time it will take me 15 minutes. By getting all of your blades at the exact same depth, you are relieving the planer from having to use the one blade that sticks out a little farther, to do the whole job. Now my planer feeds the wood completely by itself, without having to push the board through. I wiped the rubber feed drums with a little acetone to take the varnish-sap off, and combining that, with ultra sharp blades reduce resistance. This jointer planer blade attachment is not cheap, but I will recoup the investment in not having to buy new blades very often. Once they are trued up with this jig, the next time you might be able to just polish up your edges with the 1000 grit setting and compound on the leather wheel. I expect to get at least 6 to 10 uses out of my blades since I can sharpen them so well. Then when you figure the same for the jointer knives, your making money. Additionally, you can be sure of getting the job done properly. 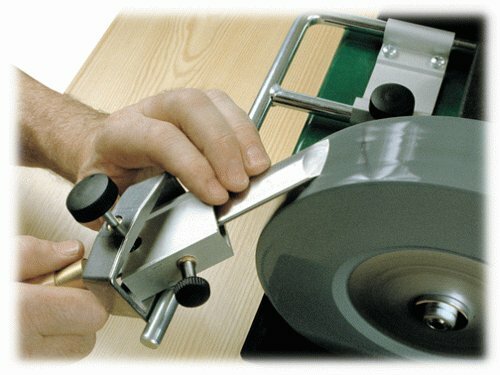 Their are professional sharpening services that take pride in their work, and their are those who don't really care about getting it perfect. I prefer to do it myself, no possibility of errors, and no down time waiting for the blades. This jig is included in the Tormek complete accessory package or individually as shown here. Either way it adds up to excellence in your work, time and money saved, and saved, and saved. Highly recommended. Every once in a while you find a really great deal. I'm an avid woodworker and bought a Tormek Super Grind a few months ago because I was tired of the drudgy of sharpening my chisels and lathe tools. I was amazed at he quality and speed of the Tormek system compared to the Delta sharpener it replaced. This is a woodworker's prayer come true. I immeadiately purchased the SVH-320 jointer and planer blade attachment. The system has already paid for itself in six months use. Quik and easy is an understatement. Blades, chisels, cutters and gouges are razor sharp and simple to touch up. The technical services and website are great. I can't recommend this equipment or company highly enough to do them justice. This sharpening system is practically flawless. The stone easily goes from a coarse (220 grit) to a fine (1000 grit). The side of the stone quickly flattens a chisels back. The honing wheel puts a mirror finish that is better than razor sharp. 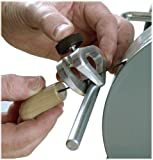 The jigs allow for sharpening of most any tool. If you are a beginne to tool sharpening this system and stone will get you going quickly. The learning curve is "sharp" as your tools will be. 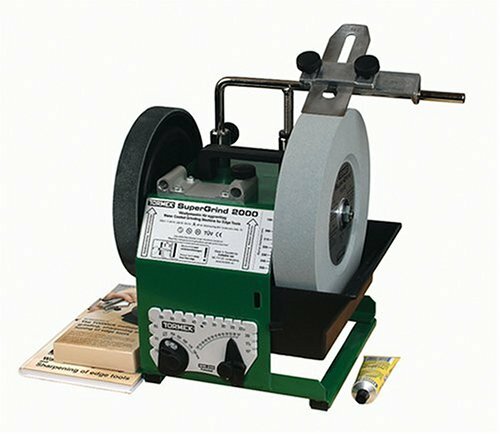 This grinding wheel is 10" in diameter and is specifically designed for use with the Tormek sharpening system. Mine came to me with two perfectly flat sides and the circumference perfectly square (a necessity for certain grinding operations with the system). The single drawback I've discovered is that is rather soft and damages quite easily. I slipped off the edge of the stone while grinding a chisel and scored the edge. If you own a TORMEK, and you're not using one of these graders, you're cheating yourself. One side of this stone is coarse, and "opens" the TORMEK's grinding wheel... making it good for quickly removing a lot of material. Then, when the other side of this stone is applied to the wheel, it fills the wheel's pores and makes the wheel fine. Without this grader, you'd have to go from a very coarse grind right to the leather honing wheel... which makes a lot of honing necessary. This is the one TORMEK accessory that I regard as a "must have." Go ahead... order one! You won't be sorry! This accessory is like a lot of the other TORMEK accessories -- it costs a lot. Across the board, their accessories (and even the machine itself) raises the eyebrows of the purchaser when you see the price. But... that shock goes away once the tool is in use. Their system is so simple, yet so effective. This profiled honing wheel is no exception. When you first open the box you'll notice the quality of the washers included... that may sound stupid, but it's indicative of the quality of all the TORMEK components. This honing wheel works great on gouges and 90-degree carving knives. It "completes" the wheel array on the TORMEK machine... transforming an already versatile machine into a complete sharpening center. It's a neat and quick way to hone a turning gouge... keep it near your lathe. Like everything else TORMEK, this thing isn't cheap... but quality doesn't come cheaply, and the cost is more than offset by the utility of this wheel. When using the Tormek sharpening system, after the job of sharepening is done, the manufacturers suggest using the leather honing wheel to deburr the tool sharpened. I say suggest, as it is imperative a user do this. By using the leather honing wheel, the user will be able to deburr gouges much easier than using the supplied wheel. The curved shape of the leather wheel makes using it very easy and very simple. This cover is a good investment, and here's why. It keeps dust off your wheels. That's not a big deal on the stone, but it is a factor on your leather honing wheel and the profiling wheel (if you have one). If you use your machine daily, this item probably isn't necessary, but if you're like me, you sometimes go for weeks without using your machine. It sits out in the open while dust flies all around it, and it's such a terrific machine, and you've already made a significant investment in it... so the extra expense of a cover is justified. I bought a Tormek and forgot to get a cover for it. I installed my Tormek in the garage, and after a couple of days noticed a lot of dust build up. Because the Tormek machine is so beautiful, and because I want to protect my investment, I sent off for the cover. I know, some of you may ask, "Well, why not use a towel or shop rag to cover it up?" My answer: Would you cover a Porsche with a blanket? This compound works great on the leather honing wheel. It can also be used on the leather profiling wheel. It makes the machine do more with less time and less wear on the machine. It also extends the life of the leather wheel, and a little goes a long way. I've done a lot of sharpening, and I'm not through my first tube yet! It's a "must have" for the TORMEK.